This project was a real triumph for us here at Punished Props. It was our first big collaboration with our friends at Tested and Smooth-On. This was a month long build leading up to SDCC 2015. I did the majority of the fabrication from MDF wood and all of the pieces were molded and cast using materials contributed to the project by Smooth-On. Over a period of 21 crazy days, I built the master from scratch and detailed it all in several videos, linked below. I also got a ton of help making the molds from my amazing wife Brittany! I couldn’t have done it without her. 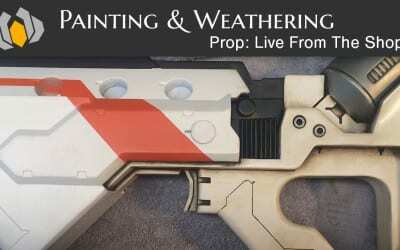 Bill answers questions about painting and weathering techniques as he paints his District 9 gun. 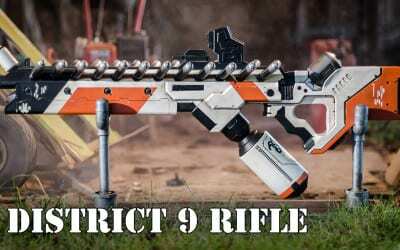 Here’s my replica prop build videos for the District 9 Rifle! 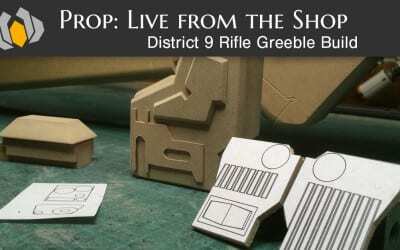 Bill adds the final details to the master of his District 9 prop replica rifle! 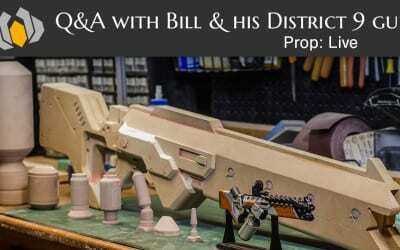 Bill answers questions about his current gun build, MDF, tooling foam, adding electronics to props, catalyzed filler, making a moving trigger, attaching resin kit pieces, small business stuff, body fillers, sealing metal paint, and more!